Now, back to the really important stuff – food. At any rate, here is another orphan recipe collected sometime in 1992 and first prepared for my family then. We love onions, as an accent to a particular dish, or as the main ingredient. Raw, stewed, fried, roasted, bring ’em on. I probably use six to eight pounds per month, if I am doing a lot of cooking. For general cooking purposes, I buy yellow onions in a three pound bag. Occasionally, I find a bag of purple onions, which we love, especially in salads. Vidalias, when available, are a treat, and a big Bermuda onion, sliced nice and thick is perfect on a “Cheeseburger in Paradise”, even if the paradise is only your kitchen table. Green onions, or scallions, can’t be beat for certain things. Love them for salsa, scrambled eggs, salads (if I don’t want to use purple onions). Shallots offer a distinctly different taste, often described as a cross between garlic and onion. I guess the point is, there is an onion for every purpose under heaven, and I hope there are onions there, too.I found the following recipe and I’m glad I did. It’s a great one for a warm sidedish, and could possibly take the place of a potato. Try this next time you have a few sweet onions on hand. 1. Set oven to 450 degrees. Brush gratin dish with oil or spray with Pam. Scatter garlic in pan. 2. Place onion slices over the garlic. Drizzle with two teaspoons of olive oil and sprinkle with salt and pepper. Toss onions to coat. Bake ten minutes. 3. Meanwhile, mix the crumbs, Parmesan and rosemary in a small bowl. Slice the tomato halves lengthwise into 1/4″ wedges. Remove dish from oven and toss the tomatoes with the onions. Sprinkle with more salt and pepper, followed by the crumb mixture. 4. Return to the oven and bake 25 minutes. We keep trying to incorporate more vegetables into our diet. I’ve given up trying for the eleven or twelve fruits and vegetables recommended by some experts. I like vegetables, but the thought of preparing, cooking, eating that many in one day, kind of puts me off the whole idea. I’m going for four or five, and that’s counting a glass of tomato juice or V8 in the morning. I know the key is variety and portion control. We are told to try for as many colors per day as possible. You could have a carrot at lunch, a sandwich with tomato slices and a few leaves of lettuce – dark green or green and red, please. That gives you three vegetables, maybe. Then at dinner, a salad with a mix of greens, maybe a little spinach thrown in, some bell peppers – they are available red, yellow, orange, purple, and of course, green. That gives you two more for a total of five. Throw in some broccoli, and that’s six. Have some cantaloupe, an apple, or a handful of berries for breakfast or as a snack, and that’s seven, nine if you go for all three fruits. An orange in the morning or a banana and you have your eleven. I don’t know about you, but that’s more than I want to eat. Just the fruits and vegetables alone would make me full. Forget the meat, dairy, and carbohydrates. But then again, that’s the whole agenda-driven idea behind the dietary recommendations of many activist-nutritionists these days. I tell them, go for it! Just don’t expect me to follow your regime. Anyway, any time I can combine several vegetables into one dish and make enough to have leftovers, I am happy to do so. For Thanksgiving dinner, we serve winter vegetables that have marinated for several hours, and then been roasted for almost an hour. It’s very good and with a few substitutions here and there, we make the same thing during the summer and cook it on the grill. Tastes great and we chalk up a few more vegetables on our daily diet scorecard. Here’s the recipe. Feel free to substitute other winter vegetables, keeping in mind that some take longer to cook than others. At the bottom of the recipe I will list the vegetables that we use in the summer or whenever they are available. 1. Combine all the vegetables, except the garlic*, in a large bowl. 2. Mix the oil and vinegar in a small bowl or cup. Pour over the vegetables and toss. Sprinkle with the salt and pepper and toss again. 4. Set oven to 425. Spread vegies on a large rimmed baking sheet in one layer. Roast in oven, shaking the pan every 10-15 minutes, for about 50 minutes. Add the garlic to the vegetables after the first 20 minutes. 5. The vegies are done when they turn a toasty caramel color and are fork tender. Garnish with fresh parsley and serve hot or at room temperature. * the garlic will burn if cooked for the whole time with the other vegetables. In the summer, the vegetables we use are red onions, zucchini, summer squash, mushrooms, bell peppers cut in l” squares, with cherry tomatoes added the last 5 minutes on the grill. We have a grill “wok” without which, we would lose more vegetables than eat. We sometimes change the marinade, replacing the balsamic vinegar with lime juice and adding a teaspoon or so of soy sauce. Garlic falls through the holes in the wok so we don’t use whole cloves but mince a few cloves and mix with the marinade. These vegetables cook more quickly than the winter ones, so we don’t use a very hot grill and stir the vegetables a few times during the cooking (about 10-20 minutes) to prevent the great carmelization from turning into burning. I like both versions which really are totally different. We occasionally roast the “summer version” inside in the oven if the weather turns ugly. There is nothing like boneless chicken breasts for convenience. Someone else dispatches the poor bird, plucks it and guts it – all those unpleasant chores required by us carnivores. Then, Chicken Little is dismembered and its breasts are de-skinned and de-boned for our convenience. All that for a price, I might remind you. Gone are the days when most people had a little coop in the backyard, with a few hens and a rooster to keep the families intact, the chopping block and hatchet at the ready. This was the source of the expressions I heard as a child from my mother and grandmother from their days on the farm. “He’s running around like a chicken without its head!” “Quit that or I’ll wring your neck!” We knew that there was no way our necks were in danger but the message got across very well. Today, we go to the grocery, pick up a plastic pack of nicely skinned and boned breasts for five or six dollars and head home to prepare a quick meal without all the struggles previously mentioned. Properly prepared, the breasts can be cooked in 6 minutes, bathed in a sauce made in another 3 minutes and devoured in five. You can’t beat that for efficiency. With that in mind, I looked yesterday for a recipe for the three boneless breasts I had in the refrigerator. I wanted a relatively simple dish, but one with a tangy flavor to go with the succotash that I was planning to fix as a vegetable side dish. When I think of “tangy flavor” I usually think of lemons or mustard. In this case I decided to go with the mustard. I started cooking the succotash, a recipe that I will give you below, and preheated the broiler. (I could have cooked the chicken outside on the grill, but it was just too darn hot!) I transferred the breasts to a broiler pan and broiled them about 4 inches from the heat for 3 minutes per side, then I turned the broiler to low (you could move the rack down one level if you only have one broiler setting) flipped the chicken back to the first side again and sprinkled them with Parmesan cheese. I continued cooking them for another three minutes until the cheese was starting to turn golden brown. They were ready to eat. I’ve been making this dish, or variations of it, for years. Some recipes call for bread crumbs and garlic; some for yogurt instead of mayonnaise; some for Worcestershire sauce, for a deeper flavor, or cayenne pepper for some heat. The one I used today is just about the simplest. Don’t have any rosemary? Don’t let that stop you. The chicken will be delicious without it. We had a few slices of fresh no-knead bread and succotash for the rest of the meal. The succotash is a recipe from the Fine Cooking website. It is a little different from the frozen box of corn and lima beans that I personally hated as a child. It has a lot more vegetables in it and would go a long way to furnishing the variety of vegetables that we are urged to eat daily. It is quick to prepare, despite the relatively long list of ingredients, but benefits from advance preparation, cutting up the vegetables and lining them up on the counter in the order to be added to the pot. It takes about fifteen minutes of cooking, and about fifteen minutes of chopping the vegetables. I used custard cups to hold the individual vegetables and had everything ready about an hour before I wanted to cook. They just sat there on the kitchen counter, the fragrant onion and garlic making my mouth water in anticipation. Here’s the recipe, again, thanks to Fine Cooking. Heat 2 T. oil in a deep 10″ saute pan of a large shallow pot over medium-high heat. Add the onion, chile flakes, and a generoud pinch of salt and cook until the onion is soft and has started to brown, 3 to 4 minutes. Add the bell pepper and cook until softened, about 2 minutes. 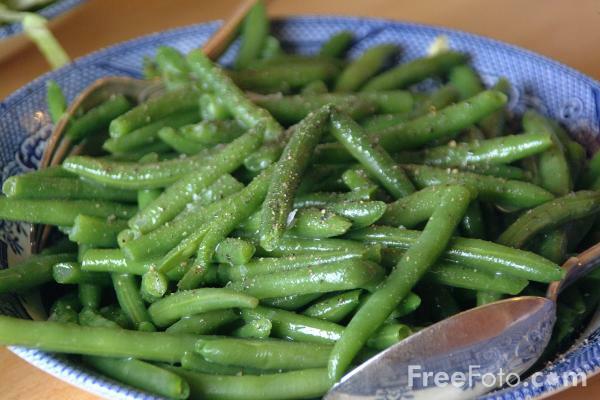 Add the green beans; cook for 2 minutes. Push some of the ingredients aside to make room to saute the garlic. Heat the remaining 1/2 t. oil in this spot, add the garlic, cook until you smell it, and then stir it into the vegetables. Add the zucchini and a pinch of salt to draw out some moisture and cook for 2 minutes. Add the corn; cook for 2 minutes. Add the lima beans and tomato and cook until all the vegetables are perfectly tender, about 2 minutes more. Stir in the butter, parseley, and basil and season with more salt, if necessary. This is a very colorful group of vegetables and tasted great with the tangy chicken. Give it a try. And lets hear it for the chicken neck wringers, plucker, de-boners and grocers!